Visitors from warmer regions might think we’re crazy to hold an outdoor brewfest in February, but cold weather is no match for Missoula’s craft beer scene. Caras Park fills with Montana brewers, live music, food trucks and burn barrels to heat cold fingers. Best part of a winter brewfest? Your beer never gets warms. The Garden City Brewfest is Missoula’s original brewfest, now entering its 27th year. Excitement is at an all time high as locals shed their puffy jackets and soak up the spring sunshine. Sample your favorite Montana brews, kick your shoes off and dance to live music in the grass, or pop over to Brennan’s Wave and see what the spring surfers are dishing up. Psst! Want to win free tickets to the Garden City Brewfest AND a fun-filled weekend in Missoula? 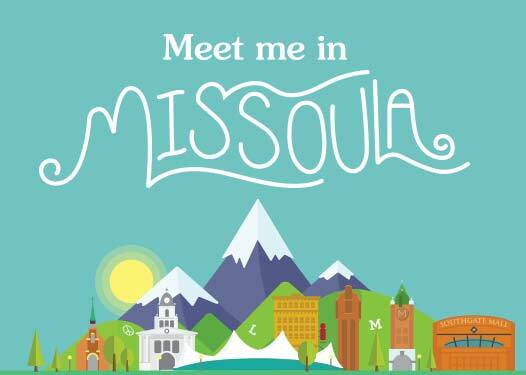 Enter to win our Meet Me in Missoula giveaway here. Craft beer tastes even better when you’re drinking it for a cause! The Annual Maverick Brewfest takes over Caras Park each September to fundraise for the Missoula Athletics Council. Soak up the last warm days of summer as you sample local beer and food to the sound of live music. The Montana Brewers Association aims to promote and spread the “freshest, highest quality Montana-made beers” and part of that is throwing a beer “rendezvous” throughout Montana each season. Lucky for us, they’re headed to Missoula in fall! No waiting in line for tokens at this brewfest—one ticket includes the price of admission, one collectible glass, samples of Montana-made beer and all the live music your heart desires. Every April we come together in Caras Park to celebrate two of the better things in life: bacon and beer. The 8th Annual Bacon & Brew Fest features live music from 406 and The Tom Cats, local vendors, and plenty of beer to sample with the purchase of tokens. The Missoula Marathon was recently named the #1 marathon in the country, with scenic views and community support that simply can’t be beat. In addition to the classic marathon, the yearly Missoula Marathon Beer Run brings beer lovers and runners together for a relaxed 3-mile route full of socializing and topped off with free beer and entertainment! In Missoula we love the public lands, waters and wildlife right outside our own backdoor. Enjoying the great outdoors is more than recreation for us, it’s a way of life. The 4th Annual Beers, Bands and Public Lands Brewfest celebrates that passion with live music, vendors and (of course) beer! < INSPIRE Missoula: MCT, Inc.